Recreate scenes from Dr Frankenstein's laboratory this Halloween! 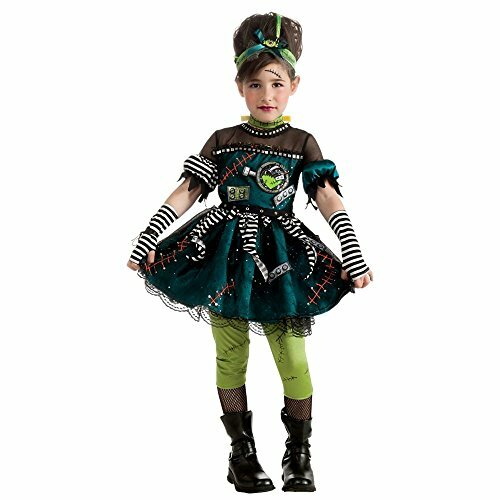 With Frankenstein's monster children's costumes for an instantly recognizable horror outfit for your kids. Ever since Mary Shelley's fertile imagination conjured this lumbering creature made from human spare parts, we have remained horror-struck by the concept. That's the great lure of a kids' Frankenstein Monster costume really. Classic horror never goes out of fashion. The creature costume bought today may be worn, then stashed away. Children grow so fast, they might not fit it this time next year. But sitting there on a shelf, or tucked away in the back of a cupboard, this same Frankie costume will be as current for your eventual grandchildren, as it is for their parents in childhood right now. It may emerge any time in the interim, as an emergency Halloween costume for any kid, always in style, always with the horror current. Can you really say that about much else? You buy these outfits for just one day, but with a classic Frankenstein children's dress up, that day may repeat over and over again. There's a certain look that we've come to expect in how Frankenstein's monster will be. It owes less to the graphic descriptions painted in ink by creator Mary Shelley, and more to how vividly Boris Karloff and Elsa Lanchester brought the creature and its bride to life in the 1930s movies. Two things were anticipated when I set out on a quest for children's Frankenstein costumes for Halloween. They were that the majority would target boys, and that they'd all be variations on a theme of that originally produced in a Universal Studios wardrobe room. I was wrong on both counts. Scroll down and you will see. 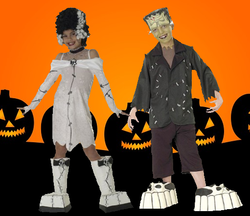 To begin, we do have that classic costume for Frankenstein's monster and Bride of Frankenstein for kids. Everything here as we've come to anticipate in the aspects of both creatures. The style is recognizably Boris and Elsa. Nor is this coincidental. These Frankenstein children's costumes are officially licensed by Universal Studios. They've been designed upon that enduring theme by Rubies Costume Co, which means that the quality is there too. The Kids' Frankie costume is a four piece outfit, as the shirt beneath is only an insert, though that too is included. Order it larger than necessary. It runs small and you can always pack extra warm clothing underneath if you go too large. It's hardly like it matters if bulk is added to Frankenstein's monster! 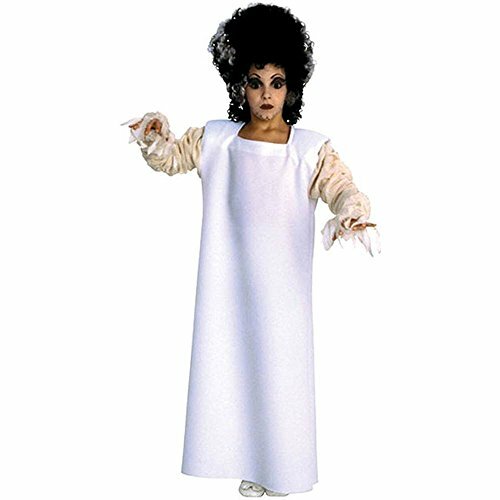 Kid's Bride of Frankenstein outfit comes in three sections - decorated dress, wig and shoe covers. The dangling cable decorations are attached to the dress. 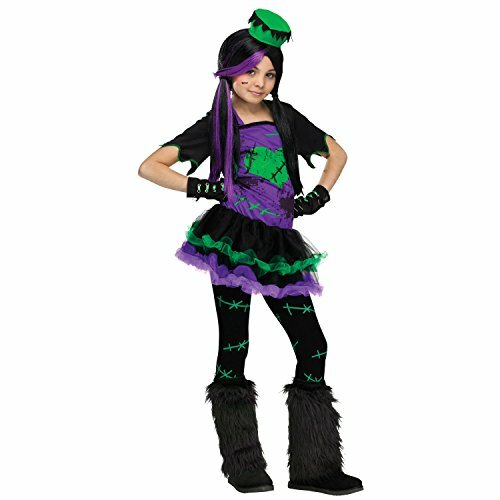 Universal Studios, in conjunction with Rubies Costume Co, also offer child-sized versions of their adult Frankenstein and Bride costumes, as seen below. 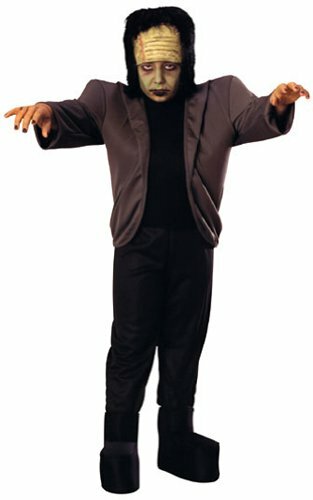 Just to keep us on our toes, this Universal Studios' Monster Frankenstein costume for kids runs larger than expected. Check the size chart carefully before you order, though again you can't go wrong bulking this one out with extra warm clothes beneath. Boris Karloff wasn't known for having a wraith-like frame. There's a nice touch in the child's Bride of Frankenstein costume here in that the wig has been scaled down to fit a young girl. I did wonder about that, but apparently it works a treat! Looking for Frankenstein Family Costumes for Halloween? Frankenstein's monster and bride have made an indelible mark upon the horror parade. Fancy taking on the roles this Halloween? We have an array of costumes to fit the bill! Thunder crashes and lightning strikes - a hit! A creepy laboratory filled with crackling and light! But wait... What a cutie Dr Frankenstein's little monster is this time! Remember how I said most Frankenstein costumes for kids are targeting girls? Here's where it begins. I really did anticipate various Karloff type fancy dress, but instead there seems quite a fashion for designing girls' Halloween dresses inspired by Frankenstein's monster. This one is by Princess Paradise, a Colorado based company recently bought out by Rubies Costume Co. Both have a reputation for quality creations, so you can't go far wrong here. I really do love this outfit, which is also made by Rubies Costume Co. I like the attention to detail in the decoration, as well as the rich colors chosen. There's more in it the closer that you look! Called Frankie's Princess Kids Costume, it's for young girls who want to be princesses AND a lumbering creature created from human parts. Whoever said that you had to choose between such things? Incidentally, you get the leggings, but not the fishnet tights beneath, nor the boots. Everything else arrives as seen. Rubies Costume Co are really going for it this year on the old Frankenstein girls' costume dresses. 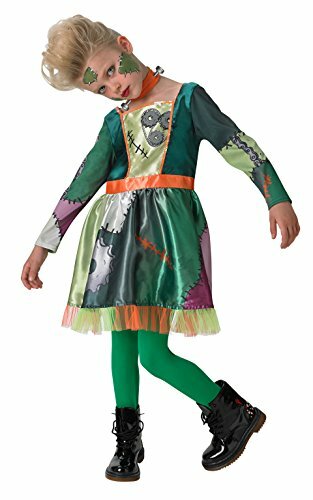 This is another one from their catalog, entitled Frankie Girl Kids Halloween Fancy Dress, which seems to cover it nicely. Here finally we find another Frankenstein costume for boys (though I see no reason why girls couldn't wear this too, nor the lads any of the other outfits featured herein) and this is a complete surprise. Instead of a sea of Boris Karloff copies, we actually get one which appears based on Mary Shelley's description of the creature in her book! Created by Design Costumes, this Mary Shelley Frankenstein's Creature Costume has a very cool feature. The red ball clutched in his hand is a pump, which activates by air a mechanism for making the open heart pulsate. Suitably grisly for you this Halloween? Just to prove that it's not just Rubies Costume Co creating girls' Frankenstein fashion items for Halloween, there's Fun World Costumes in on the act too. Perhaps it's a thing this year? In which case, my initial blarb about classic costumes enduring longer in style than the fashionista fads just took a twist in ending. Oh! Well! I'm sure these will stand the test of time as well! RAWR! Kids! Choose a young monster costume for Trick and Treating this Halloween - scary, furry and above all WARM in those chill October evenings. OoooOOOOooohhhh! Everyone knows that Halloween is the time when ghosties come out to haunt. Look the part with these Trick and Treating children's ghost costumes. Twilight, Dracula, Monster High, the blood-sucker of legend is never far away. These kids' vampire costumes for Halloween make for the best dressed spook in town. They really do, don't they? I have to admit though that I have a soft spot in my sentiments for Frankenstein's Monster. This story was my favourite when I was a kid. 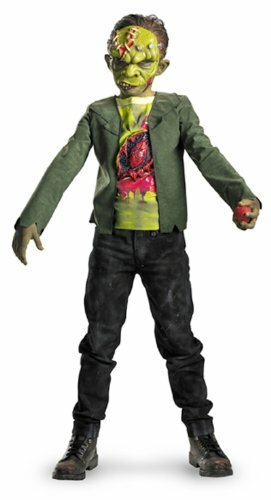 I have to say this - even though they are Frankenstein's costumes from horror movies, they still look lovely on the kids.